Includes all food and beverages (standard ship's bar, too) aboard the yacht. Includes unlimited diving (bring own gear or rent BC/Reg) featuring the wrecks of the British Virgin Islands. Wrecks to be dove include: The Beata, The Inganess, The Fearless, The Marie L and the Pat. 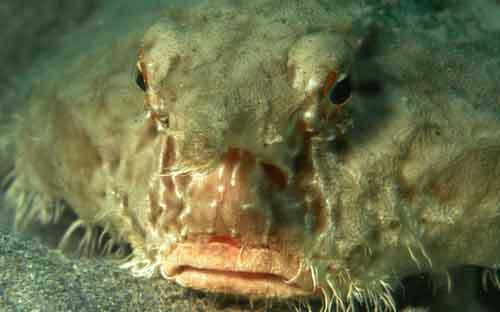 Promenade will also do a minimun of 3 dives on the wreck of the RHONE, including a night dive. 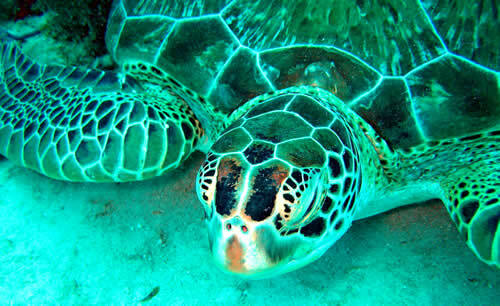 Promenade will also, weather permitting, dive the spectacular wrecks of ANEGADA including The Chikuzen and The Rocus. This offer also includes a special souvenir Tshirt and tickets for the wrap up party on Cooper Island on Friday night! Promenade still has space available on their November 26 to December 2, 2006 cabin cruise week. They have reduced the rate to $3200/cabin, double occupancy (i.e. $1600/each person). Diving is extra and gear can be rented or you can bring your own. There is also room aboard on their January 28 to February 3, 2007 trip, as well as March 25-31, 2007. These are both at their normal cabin rate of $3900/cabin. Promenade is a great dive boat but they have lots of other activities as well. This is an excellent opportunity for two people to charter a large boat. Promenade is a fun boat! Contact PARADISE CONNECTIONS YACHT CHARTERS for more info. 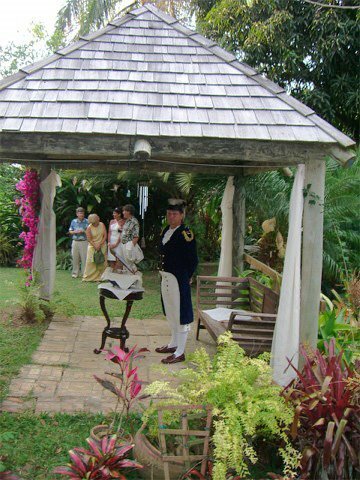 Effective Dec. 16, 2006, Delta will add flights between its largest hub in Atlanta and Fort de France, Martinique in the French West Indies. Martinique is the second destination that Delta will serve in this region having recently announced twice weekly service to the French island of Guadeloupe, effective Dec.13, 2006. Both routes are subject to foreign government approval. Delta customers traveling to the United States and Canada from Martinique will benefit from 97 daily one-stop connections to destinations throughout the region, including key business and leisure destinations such as New York, Chicago, Montreal, Los Angeles, San Francisco, Miami, Tampa and Orlando. The service will be operated using Boeing 737-800 aircraft with 16 first class and 134 economy class seats. The motoryacht TOUCH is offering a special rate of $50,000, plus expenses, for a 7-night charter between November 22 – 30, 2006 in St. Maarten. This is a $15,000 savings. What a wonderful way to celebrate Thanksgiving with your friends and family! We visited TOUCH at the St. Maarten Charter Yacht Exhibition last December and we were very impressed with the yacht. The Master cabin with its own private deck is quite cool. 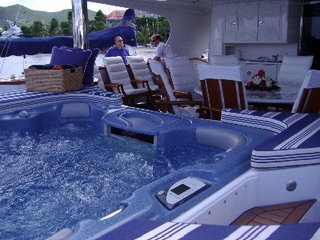 One unique feature they have is a jacuzzi just behind the aft exterior seating area on the main deck. They have satellite TV aboard so you will not miss any of the games over Thanksgiving weekend (unless you want to!). Feel free to contact Paradise Connections to book this yacht or for more information. You may get our email address and phone numbers HERE. We've been busy... busy is good! Sorry that we haven't added anything to our Yacht Charter Blog so far for September, but we have been very busy. Busy is good! Don't delay, contact Paradise Connections for your upcoming sailing vacations! Catamaran Marolanga Gets a Vacation! Gus & Marcella, owner/operators of the catamaran Marolanga, were surprised by their children who gave them a vacation in Italy as a birthday gift. They are currently in Italy, enjoying family, sights, and Italian cuisine. Gus and Marcella will return to Marolanga and be ready to charter in mid-September. 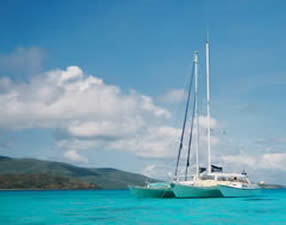 They are one of the few charter yachts available in the Virgin Islands throughout the summer season. For those of you who are sitting on the fence, regarding a sailing vacation this autumn, perhaps this will help: American Airlines is having a Fall Sale. Fares are valid for outbound travel August 7, 2006 through December 11, 2006. Return travel must be complete by December 13, 2006. Tickets must be purchased NO LATER than 11:59 p.m. August 16, 2006 (CDT). (Tickets must be purchased at least 7 days prior to departure or within 1 day of making reservations, whichever comes first). Consult American Airlines for details. This is a great offer because this falls into the "summer rates" category and some yachts have lower rates during this time. The 65-foot trimaran Promenade has added another cabin cruise to their busy calendar. Kerry now has two weeks dedicated to cabin cruises for next season. These are all-inclusive, 6-night charters for $3900/cabin (double occupancy, not each person). Bonnie Lynn has two available dates this August for a daysail charter in Maine. We hope that someone will be able to take advantage of this rare opportunity. Rates given are approximate. For more information, contact Paradise Connections: CLICK HERE for contact info. TREAT YOURSELF - Take a break, unwind in style, and leave life’s daily drama behind. For total relaxation and impeccable service, take advantage of a DRAMALESS weekend special in St. Maarten. Their 19-foot Mako tender is included in the charter rate. DRAMALESS is an 82-foot Hatteras with 3 crew, that can accommodate 6 or 7 guests in three cabins. Hurry, offer valid only for charters taking place in September and October 2006. Click HERE for their electronic brochure. WEEKLY RATES: $18,500 for up to 6 guests, plus all expenses. Available in Western Med from 4 -21 August 2006, and after 5 September in Monaco. Fruition is an 80-foot ketch, which accommodates 6 guests. The aft, full-width master cabin has a private entrance from the cockpit. There are also two guest cabins, each having a pair of large twin lower singles (not bunks). All cabins have ensuite head/shower. Lots of space for relaxing : the roomy cockpit, panoramic deck saloon and spacious lower saloon. WEEKLY RATE: $17,900/2 guests, $18,900/4, $19,900/6 (plus all expenses). Fruition is available in Palma from 10 August 2006 onwards. Well, it's true... I heard about it earlier this week and just had it confirmed via email from the Willy T's... Due to a recent near-fatal accident, jumping off the William Thornton Floating Restaurant and Bar will no longer be allowed. How is one to earn their free t-shirt? The Willy T's will be closed September through the first week of October 2006. Join the 138-foot catamaran, Douce France, on her world tour. DOUCE FRANCE offers flexible accommodations for up to 12 guests in six identical en suite cabins, convertible from two twin beds to one king. The attention of her international, professional crew of 8, including a scuba instructor, ensures your charter will be most memorable. The 250 bottle cave à vin of select wines will please the most discerning guest and compliment the French chef's culinary skill. An atmosphere of luxury and elegant décor, surrounded by a world of beauty and adventure. Click HERE for their electronic brochure. Brochure #2. Brochure #3. Rates, locations, and availability subject to change. 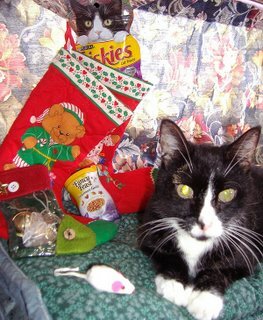 Bullwinkle knows what boat he'll be on for Christmas! Do you? Check out current special offers on crewed charter yachts. Here's some news from recent happenings aboard the charter yacht Promenade, a 65-foot trimaran, owned and operated by Kerry and Bazza out of Tortola in the British Virgin Islands. An excellent choice for a sailing and diving vacation. A few days ago, Kerry sent us this: "Muskmelon was nice and flat and Bazza and I went for a dusk dive out in the mud to see what we saw, I took my camera along, and LOOK what I found!!!! This is the first time that i have seem one of these!!!! We probably took about a hundred pictures of this batfish. I did not want to come up! This is quite a rare find." Look at the lips on this guy! What an expression! Kerry recently received her underwater housing for her new Nikon digital camera. Looking forward to some more excellent photos from Promenade. Here's another interesting bit about Kerry and her turtle friend: "Yep, he never has been too scared of me, but the last couple days he has really let me come close to him. Yesterday he sat there for ten minutes while I stroked underneath his shell!! The neat part was that he went up for air and then came back down and laid beside me again, so I really knew I had made a friend!! I don't think I have ever had such a pleasing experience in the water." Promenade a large 65-foot trimaran, with a fun crew and is a wonderful boat for families and groups. Besides being the ideal dive boat, they also have lots of water toys for other activities, plus the boat is so spacious that it is not difficult to find a quiet spot if you so wish. Promenade is air conditioned and has 5 guests cabins; three cabins have Queen berths, while the other two can be configured either as Kings or as two Twins. Promenade has a 14-foot dinghy with 50HP motor, waterskis, kneeboard, tube, several kayaks, 5-person banana, snorkeling gear, fishing equipment, projection TV/VCR/DVD in the salon, a portable DVD player, Game Boy, Play Station 2, iPod friendly, dedicated guest computer for email access, compressor to fill scuba tanks, and much more. Promenade has a Dive Instructor aboard so anyone can dive... give it a try! Here are some more photos from a recent charter aboard Promenade. This is a photo of the foredeck to try to show how much room there is aboard this 65-foot trimaran. She has a 35-foot beam (width). Promenade is one of the few charter yachts which has a commercial fishing license for the British Virgin Islands. They usually do catch and release, but I believe this fish might have been dinner. 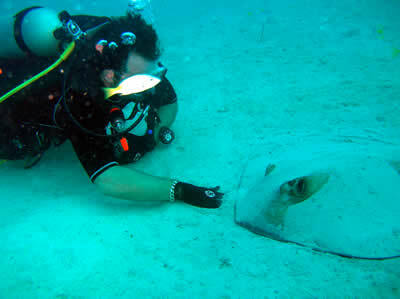 Rays are just soooooooo cool. They sure make a big splash when they jump out of the water. Group shot in front of the famous Wreck of the Rhone. Photos courtesy of s/v Promenade. Thanks, Kerry! To view Promenade's electronic brochure, CLICK HERE. Please contact PARADISE CONNECTIONS for more information. 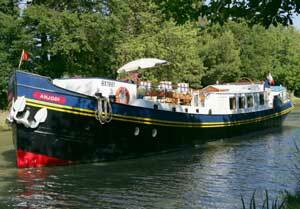 Several canal hotel barges are offering special discounts for October and/or November 2006 barging holidays. 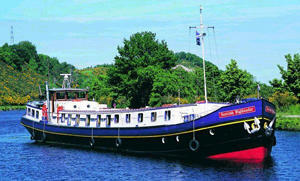 October 2006 Departures: Three French barges in the regions of Burgundy and Provence, plus SCOTTISH HIGHLANDER in the Great Glen of Scotland... say hello to Nessie! And two for the month of November 2006 for Provence France, including ANJODI. Where no cabins are booked on a cruise, a minimum of 4 passengers are required to guarantee the cruise. 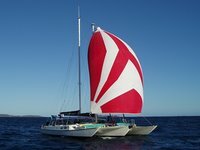 We just received an email from Hans & Ruth, owner operators of the fabulous charter yacht PENTESILEA, a Privilege catamaran. "I have to tell you a fish story which happened on our last charter. We are securely anchored in a lovely bay. One of the teenage guests is napping/reading in the aft cabin, with the deckhatch open to keep her cool. Her Mom is standing back in the cockpit with one of my famous painkillers in her hand. Suddenly this large silvery thing comes flying thru the air, lands on the open deck hatch and slams it shut, bounces off and lands on the cockpit sunning mattress. Teenager hollers : "what the h…..," Mom shrieks…. "wow look at this". The fish is frightened to death never having been on Pentesilea and with a mighty kick gets off the boat back into his/her environment. As I charge out to the cockpit to check on the ruckus, mom is laughing so hard and points to the wet spot (made from the fish and not mom) on the sunning mattress. I guess it was true; it was not the painkillers fault." This summer's plans for Pentesilea besides polishing and varnishing, will be new interior upholstery. Pentesilea is one of our favorite catamarans and charter yacht crew. Pentesilea is fully air conditioned and accommodates up to six guests in three cabins with ensuite heads. They will take a young child as a 7th guest, inquire. Lots of toys and lots of fun! Good rates, too. Pentesilea also includes a 2-tank, rendezvous dive for their guests. For more information on yacht charters CLICK HERE to contact Paradise Connections Yacht Charters. 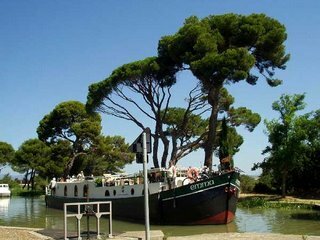 This week we have updated our web site for the French canal hotel barge, EMMA, who cruises along the canal du midi, France. We have two new pages: Guest comments & Rates. Here's a new photo of EMMA that Liz just sent us! CLICK HERE to view our web site for EMMA. We had a note from the French Barge LE PREMIER this morning, letting us know that they only have one week left for their 2006 season: August 27 to September 2, 2006. Beginning with the winter 2006 season (December 16th), THREE MOONS, a 72-foot Irwin 8-passenger ketch, will be offering diving and an island tour. 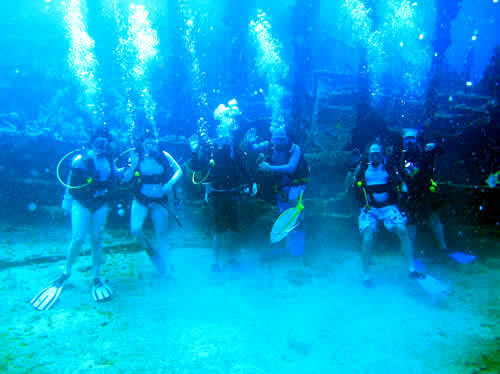 - FREE: two, 2-tank rendezvous dives for certified AND non-certified divers. This is a private dive trip with only Three Moons guests aboard. 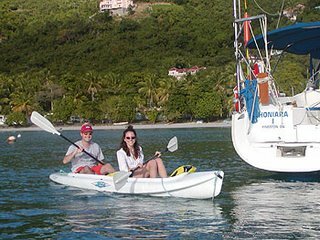 - FREE: 3-hour scenic tour of Virgin Gorda and the Baths with a private driver. This includes a visit to the Baths, lunch overlooking the Baths at Mad Dog's Restaurant, a visit to Little Dix Bay, a drive to the tip-top of Virgin Gorda with panoramic views of the surrounding islands. The land tour ends in the North Sound, Virgin Gorda, where you will meet up with Three Moons. The 65-foot trimaran PROMENADE still has space available for their six-night cabin cruise, July 15-21, 2006, in the British Virgin Islands. The special last-minute rate for this week is $2,800 for a 2-person cabin. This is an all-inclusive rate for the cabin, NOT for each person ($1400 each). While you will be sharing your sailing vacation with other people, Promenade will do their best to accommodate interests, activities, meals, etc. to their guests on board, rather than a fixed itinerary and menu like a theme park ride. Promenade is air conditioned and has 5 guests cabins; three cabins have Queen berths, while the other two can be configured either as Kings or as two Twins. Promenade has a 14-foot dinghy with 50HP motor, waterskis, kneeboard, tube, several kayaks, 5-person banana, snorkeling gear, fishing equipment, projection TV/VCR/DVD in the salon, a portable DVD player, Game Boy, Play Station 2, dedicated guest computer for email access, compressor to fill scuba tanks, and much more. 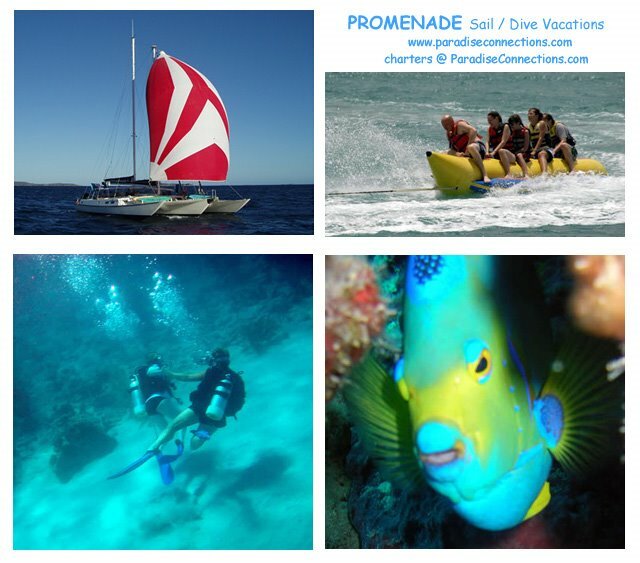 Promenade has a Dive Instructor aboard so anyone can dive... give it a try! Celebrate the Fourth of July in Boston with a yacht charter aboard the motoryacht RHAPSODY. You will have the perfect vantage point from Rhapsody's Sky Lounge with a 360-degree view to experience America's premier 4th of July celebrations with a superb firework display as well as the Fireworks Score by the Boston Pops Orchestra. 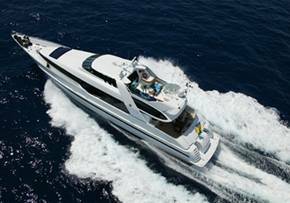 RHAPSODY is an 80-foot Lazzarra motoryacht which accommodates up to 6 guests. in three staterooms, all with Queen-sized beds. Rhapsody's water sports includes: 12' Novurania inflatable, 23' Sea Fox center console tender, 3 ocean kayaks, light fishing gear, snorkel gear, tube, waterskis, etc. The motor yacht Rhapsody is available for charter for $19,000/week, plus expenses. CLICK HERE to view Rhapsody's electronic brochure. The charter yacht IMPULSIVE, a 116-foot Norship motoryacht with a crew of SIX, has reduced their rate for the rest of their Mediterranean Summer 2006 season by $5000. 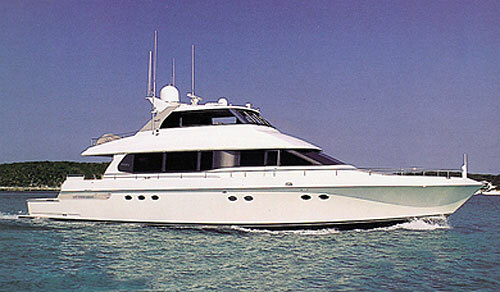 The motor yacht IMPULSIVE, is fully air conditioned and accommodates up to six guests in three luxurious staterooms. The master cabin aft is full width and has a California King size bed with his & hers ensuite baths with Jacuzzi. The other two guest staterooms have Queen-size beds. IMPULSIVE is available beginning August 10, 2006 from Rome and surrounding areas. Freedom is an 80-foot Azimut motor yacht available for charter throughout the summer for your Caribbean vacation. Freedom is fully air conditioned and accommodates up to 8 guests in four cabins (2 Queens, 2 Twins). Based in St. Maarten, but they will waive delivery fees to other "down-island" Caribbean locations. 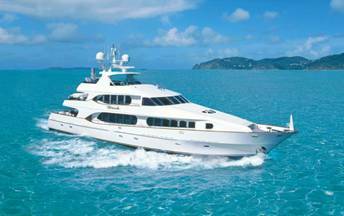 Special reduced rates for Summer 2006 yacht charters in the Caribbean for the motoryacht Freedom. $28,000 for 8 days, 7 nights (plus expenses). This is a savings of $4000. 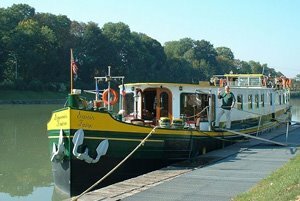 The Hotel Canal Barge SAVOIR FAIRE is announcing a 13-day cruise through France, Belgium and Holland between October 8th and 20th this year (2006). It’s a great way to experience three different cultures without leaving the comfort of your cabin! There’s so much variety and in addition, it is a wonderful time of the year to travel, as the trees are in their resplendent autumn colours. Artists would really appreciate this tour, with plenty of subjects and visits to Monet’s garden and Rubens’ house. SAVOIR FAIRE will also doing this 13-day cruise in 2007 from Amsterdam to Paris departing 6th May 2007 and again from Paris to Amsterdam 7th October 2007. If you are interested in coming on this cruise – 13 days or 6 days, please contact Paradise Connections Yacht Charters. Barb from the charter motor yacht FLAME, wrote to us recently and sent us some new photos that we would like to share with you. "Jacob is a fabulous charter cat. He really does the balance of entertainer, but not too much in your face charter host. We are very pleased and our guests have adored him. It's been a nice season!" FLAME finishes their charter season soon and they will be heading north to spend time at their home in New England. This will be little Jacob's first time visiting the landbased homestead. We'd love to see his expression the first time he sees a squirrel. Wayne is now licensed to pefrorm weddings! 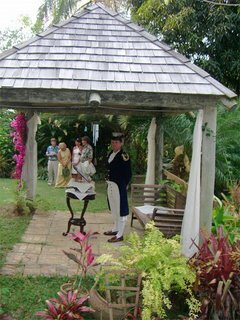 He presided over his first wedding ceremony this spring on St. John, US Virgin Islands. "Wayne did his first wedding (but it was on shore) and it was a big success. I was very nervous but could not have been prouder. He wrote the ceremony (except for the vows) and it was both sentimental and humourous. I found it VERY humourous to be introduced to the bride's family as the Rev's wife! HA! Never thought I'd be described that way!" So, if you are looking to get married in Paradise, the motor yacht FLAME is your one-stop shop for weddings and honeymoons. They are also fantastic for family charters or a group of friends! Click HERE to view FLAME's electronic brochure. For more information about chartering FLAME, contact your charter specialists: Paradise Connections Yacht Charters. We were delighted this morning to receive an email from Adele & Pierre aboard their 44-foot Beneteau sloop, Honiara. They were just leaving St.Vincent for Bequia. Honiara is now available for yacht charter vacations in the Grenadines this June (2006). Come sail with Honiara and discover the enchanting islands of the Grenadines. 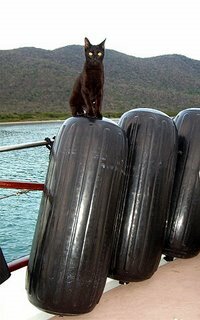 Carabella is a 41-foot motor yacht, owned and operated by the American crew of Jerry and Shary Monson, along with their two cool cats. This is a very nice boat for two. The master cabin has a Queen size walkaround berth. Carabella has satellite TV so you won't miss your favorite show or sporting event! Be sure to have Shary make you chocolate brownies... mmmmmmmmm good!!! Drumbeat is a 72-foot Irwin ketch with a crew of three. Owned and operated by Vince & Linda Stracener. Drumbeat is fully air conditioned and accommodates up to 8 guests in 4 double cabins. Vince is a dive instructor and 5 dives/week are included in their rates. Promenade is a custom 65-foot trimaran with a crew of four, owned and operated by Kerry and Baz. Promenade is air conditioned and can accommodate up to 10 guests in 5 cabins: 2 kings (which can be converted into singles) and 3 queens. Excellent boat for families and dive charters. If you're nice, perhaps Kerry will make you some homemade ice cream... it's really good! Eight nights for the price of seven for week-long charters in August, September, and October 2006. ReAction is a 55-foot Jeanneau 55 Lagoon sailing catamaran with a crew of two, Ian & Polly. ReAction is fully air conditioned and accommodates up to 8 guests in four cabins. The two aft cabins have Queen berths, while the forward starboard cabin is a double and the port cabin has twin bunks. ReAction has a dive master and offers diving to certified divers for an additional fee of $100/week/diver for 1-2 dives/day. Corus is a 42-foot Whitby ketch, owned and operated by the British couple, Bill and Ann Hasted. Corus is a 2-person yacht with a Queen cabin aft. Bill is a Dive Master and includes one dive/day for certified divers. 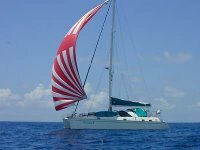 Lady Anne is a 47-foot Lagoon catamaran, owned and operated by the French couple, Patrick and Pascale Gomila. 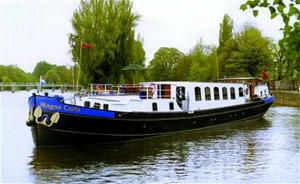 Lady Anne is air conditioned and accommodates six guests in three double cabins, all with ensuite heads/showers. Lady Anne will be available for charter in the Grenadines, Venezuela, and San Blas Islands. Sudiki is home based in the Grenadines. 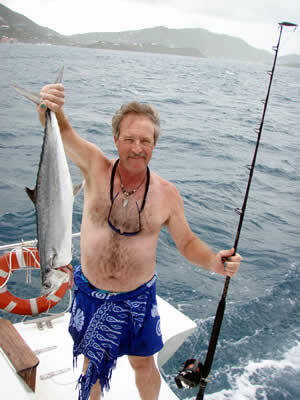 CHARTER RATES: CLICK HERE to view current charter rates. For more information on charter the yachts mentioned above, or other yachts too, contact Paradise Connections Yacht Charters, your charter specialists! Join Rene and Liz aboard their lovely barge Emma, who turned 100 last year! Felicitations! Emma cruises the south of France along the canal du midi. They are offering a last-minute summer special to fill in the remaining dates of their calendar. All remaining cabins for the 2006 cruise year are now offered at $5,500 per cabin for 2 guests (double occupancy) OR book two or more cabins and the rate drops to $5000 per cabin for 2 guests (double occupancy). So, invite your friends to join in and visit France from a different perspective. 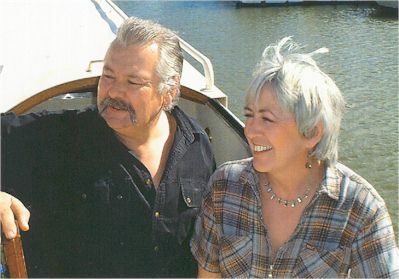 Liz & Rene were our neighbours when we wintered aboard our sail boat Loose Moose in Frontignan, France. To view Emma's electronic brochure, CLICK HERE. For more information about booking Emma, contact Paradise Connections Yacht Charters. Cruise the canal du midi in the South of France aboard Anjodi. Book 1 Cabin and get the 2nd cabin, on same barge and departure date, at 50% reduction for a cruise beginning on July 2, 2006. Click here to view Anjodi's electronic brochure. Three Moons is a beautiful 72-foot charter yacht with a crew of three, owned and operated by Shelley & Randy Tucker. Three Moons is fully air conditioned and accommodates up to eight guests in four cabins each with their own ensuite heads/shower. Three Moons is a ten-time winner for various Culinary Competitions and they have published several cookbooks. Besides great food and hospitality, Three Moons offers a complimentary foot massage! You may wish to check out Shelley's Sea Spa services, as well. We hope you will take advantage of this special offer and be pampered aboard Three Moons. Click here to view Three Moon's electronic brochure. For more information, contact Paradise Connections Yacht Charters. This morning we visited the charter catamaran Lady Anne. They are currently at anchor on the French side of the lagoon in St. Martin... about a 5-minute dinghy ride from us. Lady Anne 2, owned and operated by the delightful French couple Patrick & Pascale Gomilla, is a comfortable and spacious 47-foot Jeanneau Lagoon catamaran that can accommodate up to six guests in three air-conditioned cabins (2 Queens, 1 Double), each with ensuite bathrooms. 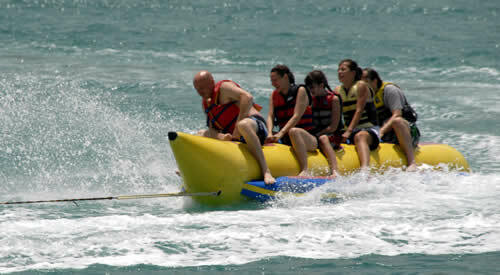 Enjoy activities such as diving, snorkeling, swimming, kayaking, exploring pristine beaches and more. Lady Anne is available for charter this summer (2006) in the Grenadines, Venezuela, and the San Blas islands. 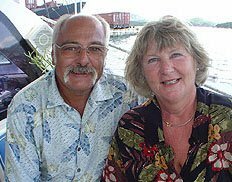 Patrick & Pascale plan to end their Caribbean charter season mid-April 2007, so now is the time to book Lady Anne while they still have good availability. Lady Anne will then sail to the South Pacific. Come relax and experience the good life that awaits you on Lady Anne 2. Click here to view the electronic brochure for Lady Anne 2. Charter a yacht for your group to follow the 2007 Cricket World Cup in the West Indies of the Caribbean. 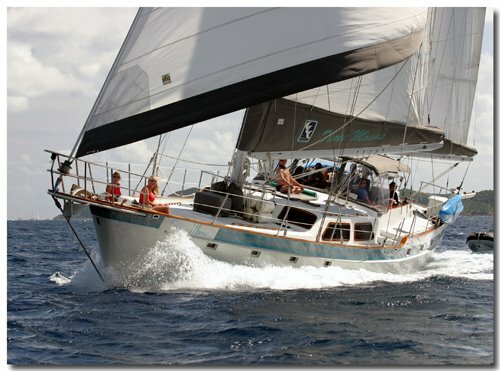 Cuan Law, the 105-foot trimaran, are available for the Cricket World Cup 2007 for a 20-person, 16-night charter beginning 13 April 2007 in St. Georges, Grenada and finishing up on 29 April 2007 in Bridgetown, Barbados. An alternative pick-up point is Rodney Bay, St. Lucia. 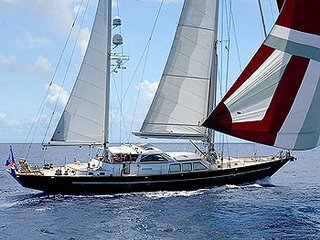 For this special 16-night charter for a group of 20, the charter fee will be approximately $160,000 to $165,000 (US Dollars). This rate includes lodging, all meals, bar and beverages aboard Cuan Law, cruising taxes/harbour fees, crew gratuity, delivery fees. It does not include dockage or personal communications. Please inquire with Paradise Connections Yacht Charters for details. 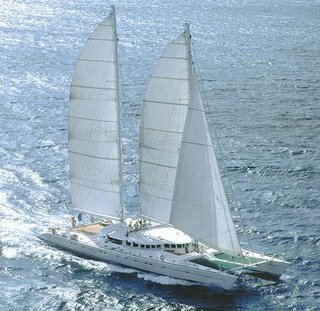 Cuan Law, the world's large sailing trimaran at 105 feet, is air conditioned and accommodates up to 20 guests in 10 staterooms, each with ensuite toilet and shower facilities. Guest staterooms can be configured with either Queen-sized beds or Twins. 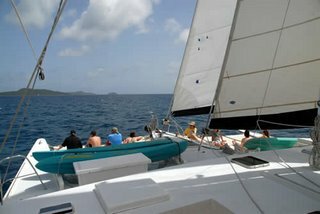 Besides this special Cricket World Cup 2007 tour charter, Cuan Law charters in the British Virgin Islands and also St. Maarten / St. Martin, including Saba. Specialty charters include PADI Dive Instructor Courses a couple of times a year. Cuan Law offers "full-boat" private charters and also individual cabin charters where you share the yacht with others. Cuan Law is best known for their dive charters but diving is not a must! There are plenty of other activities as well! Please contact Paradise Connections Yacht Charters for more details concerning chartering the trimaran Cuan Law for your next sailing and diving vacation. IRISHMAN, a 92-foot Alden ketch, is beginning a world tour through Panama and into the South Pacific where they will be chartering this summer. Join Harold and Shirley, plus their two crew, aboard this lovely sailing yacht for for your special sailing vacation this summer. IRISHMAN accommodates up to six guests in three cabins for $30,000/week, plus all expenses. There is a 12% tax in the South Pacific, but the first two bookings will receive a 50% discount on this fee. For more information contact PARADISE CONNECTIONS YACHT CHARTERS.